One of the best ways to save on food when using coupons is by shopping at stores that will double or triple the face value of your coupons. Frugal shoppers know where and when to shop so they can take advantage of the money they can save when getting double coupons. But if you are new to using coupons, doubling coupons and finding out what stores double coupons can be a bit of a mystery. Stores that offer double coupon days will double the face value of a coupon during a specific time, day and up to a certain amount. For example, if you have a coupon for dog food and the amount shown on the coupon is for fifty cents, a store that doubles coupons will give you $1 off if you've met the coupon terms. The coupon terms will state what items qualify for the discount, what size(s) you need to purchase and the date the coupon expires. Every week I receive emails asking if any grocery stores in a particular area doubles coupons. 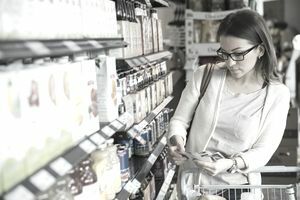 Unfortunately, grocery store policies about double coupons often differ depending on what state the store is located in. This can be true even going from one county to the next. Also, the policies regarding doubling coupons changes regularly. Because of this I always suggest to people to go their local stores and ask at the customer service desk about the coupon policy. But don't stop there! Many times our local stores are not up on the most current corporate policies. Therefore, it can be well worth your time to contact the corporate offices' customer service centers to ask about the coupon policies. This can be done either by email or by phone. If you discover that the corporate policy differs from your local store, ask the company representative to email you a copy of the policy so that you can present it to the store employees on your next visit. If your favorite store does not double coupons it may be time to change where you shop if you find another store which does offer double coupon days. You may decide to split your shopping between several stores. Many drugstores such as CVS and Walgreens now carry items you would normally purchase at the grocery store, but by signing up with their loyalty programs you could more than triple your savings on some items. Also, many small independent grocery stores double coupons, but may not have the advertising budget to help get the word out. When shopping for stores that double coupons always check out the smaller grocery stores. You can maximize your savings by remaining flexible about where you shop and getting familiar with the different promotions each store offers. It may not be a store's policy to double coupons, but often times by asking at the customer service desk will find out that they periodically offer double coupon days. Signing up on multiple grocery stores' mailing lists can help you stay informed about any special sales or double coupon day events in your area. You may be living in an area where more than one store advertises that they double coupons. But one store may double coupons up to $1, another store may have a limit as to how many or how much you can redeem and another store might double coupons without any limitations. To get the best deal you want to shop at the stores which offer the fewest limitations. While some stores may not double coupons, you might find that they will match the advertised prices of identical items from other stores within a specific area. Take advantage of it if your store does price match. Always carry the advertisements with you as proof of what items and prices you expect them to match.